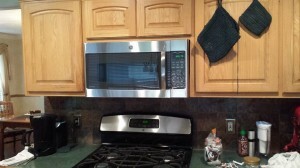 Last week lordaerith and I (mostly Aerith) installed our new microwave. It is pretty and shiny and matches our stove. It also is a convection oven, which is strange but cool. My mother was visiting us from New Orleans for Passover/Easter weekend. It was Saturday morning and we were prepping for our monthly game day and Passover Seder that night. Mom decided to bake a sweet potato in, you guessed it, the microwave. So she put it in for 30 minutes, intentionally, and went to take a shower. I think her thought process was that if the sweet potato would take 90 min in a regular oven, it should take a third of the time in the microwave. I guess she didn't notice the microwave actually had a potato setting. She also didn't poke any holes in it. So she's taking a shower and Aerith and I are watching something with Little Prince when we start to smell something burning. We go downstairs and there's a few inches of smoke at the ceiling, and the smoke detector isn't even going off. We start freaking out that something is on fire but we can't figure out where the smoke is coming from. I get LP downstairs in case there is a fire and we have to get him out and run upstairs to tell mom. While she's getting out of the shower she tells me that she had the potato in the microwave. Go back down stairs and sure enough, there is a nice lump of charcoal in the microwave and the microwave itself isn't looking too good. So we open all the windows, burn incense, Febreeze things and work on making the house smell better. Aerith and I take out the old microwave and he does some research with mom and then goes out to Home Depot to order a new microwave. It's amazing how much we've come to depend on the microwave. Just a few days without one made me realize that. The new one got delivered last Wed (and they took away the old one) and Aerith and I (ok, mostly Aerith again) installed it on Thursday. This past weekend he baked banana bread in it. Now the house smells much less like smoke and much more like banana bread. In conclusion, sweet potatoes are not to go in the microwave for more than 5-6 minutes and always poke holes in them first. Also, still no idea why the smoke detector didn't go off as we tested it and it seems to be working fine. But no one was hurt and we can tease mom about this for years to come.